Finishing the first draft of my novel just made me realize how much more work I have to do in order to make it into something I can give to an editor and first readers. In the video below, I explain how I have started the editing process with a high level review of the whole novel from a plot/character and world perspective. I am using the process suggested by Holly Lisle's “How to revise a novel” course which is excellent. Holly warns you not to line edit at this point but to identify what you wanted to write in the first place, and what were the ideas that made you passionate enough to make it through first draft. Basically, consider the novel you wanted to write. I wanted to write a fast-paced thriller based on a biblical story set in the present day, with a global search, high stakes and high body count. I don't want to give too much away about the plot but I am pretty happy that the book overall does hit the mark I set for it. But I did find over 110 big areas of rewrite in order to make the plot, the characters and the world evoked more effective and more like I wanted the story to be. Weaving back story in to make the characters more believable and make the reader care. I had created back story but not incorporated it well enough so in reading it, I realised that I hadn't actually told the reader about why this was important. Consistency of language e.g. I use the word pendant and stone interchangeably but it needs to be clearer. Also consistency of timeline. Points of view. I am using multiple points of view but sometimes I have merged them in the same paragraph which is a little confusing. Scenes and fast-paced plot. I have gone back through the manuscript and redone all the chapters into scenes which sometimes have several to a chapter. Fast pace also means short chapters so I have gone for scenes in order to rewrite coherently and then I will put back into chapters later. Locations. The book is set across multiple locations including Oxford, England; Santiago de Compostela, Spain; Jerusalem, Israel; Tucson, Arizona, USA; Tabriz, Iran and some other very cool places. I have done some good descriptions interspersed with action and some very bad ones! The contrast makes this very clear so I definitely have rewrites for those areas. That's just the high level areas! I am basically going to do the rewrites at this level first and then tackle the more detailed rewriting once the coherent story hangs together in the way I want. I can see how outlining is critical for professional authors who write a number of books per year. 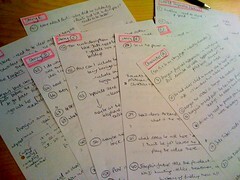 In re-outlining my scenes, I know I could have written faster with the outline I have now. Do you have any lessons learned or tips from editing? Reading it aloud always works well for me. Yes, I’ll definitely be reading it aloud after the next full edit. Thanks. Thanks Dee, and great to meet you at Problogger event! Great post! One technique I use at the high-level edit stage is to write the blurb that will go on the back of the book, and then reread the novel to see if the book I’ve written actually matches the blurb. Since back-of-the-book copy has to be concise, struggling to write it – and it can take several drafts – helps me to pinpoint what the book is about, who are the main characters, and what I would like the readers to take away from the story. Of course, the publishing house’s marketing staff will eventually write their own copy, but in the meantime I’ve fixed most of the book’s problems before I’ve sent it to the editor. ooh, that’s a great idea Libi! I have started several times to write it but it always sounds corny! I suppose all the blurbs sound like marketing though 🙂 Has to be catchy. But great suggestion – thanks! Great to meet you too, Joanna. I then carefully looked at the end of each chapter to make sure I ended with a hook that would keep the reader going. I don’t know how many times I found the perfect climax-but it was about two paragraphs before the end of the chapter. All I had to do was jettison those last, anti-climatic paragraphs, and there was my suspenseful ending. I am just about done with the first draft of my first major novel (100,000+ words). I have two smaller novels I have done (20-40,000) and editing at this level is a WHOLE new beast. Your ideas above really helped Joanna – thank you. It’s easy to get caught into catching every comma and dot, but really at this point it’s about making sure the story is flowing and the characters are progressing like they should be. One thing I would add, for this novel I started with an outline…the first time I have ever done that. It took me roughly a year to get it all together – boy what a difference. For the first 2-3 months of writing I separated it by “chapters”. But as I was writing, I realized that “chapters” really is an end product of the story, not something to come up with at the beginning. What I really needed to be doing was moving my story along by “scenes”. So I changed my way of thinking and my outline was based on “scenes”, not “chapters”, from the start and it made a huge difference. I didn’t feel as constrained and the story flowed more freely. I’m a true believer…write scenes, not chapters! Thanks Chris – I totally agree with you – writing in scenes completely changed my writing life. It was like a penny dropped and I understood how to structure everything. I also like ebooks because chapters aren’t so important so I write in parts and scenes which makes more sense to my time-based thrillers. This actually helped me so much, along with Holly Lisle’s stuff. I’m not a professional, actually just starting out as a student in Creative Writing, but this really helped me with be less… intimidated (for lack of a real world concerning my fear of this) and frustrated with my writing while I edit it. Thank you so much for this blog and the video. It really helped me look at my work as less of a bad thing and more of piece in progress! I’m doing a major edit at the moment as well. Although I think I’ll end up doing a few more passes than Holly Lisle’s methods! I’m doing a bit of a step by step series on my blog as I work through the edit at the moment, starting at the top, and working my way down. I am concluding a fiction novel , to me it will read best around 40, 000 words. I have read many books that contained 70,000 that should have been abridged to half of that. In my opinion stretching my novel to 50,000 can be be done, bu will detract from the quality of the read proportionately. Appreciate comments and advice from anyone on this subject. I also need vetting for inadvertant plagerism. I’m using folders in Scrivener for each chapter and when there’s a new scene, I just put *** then carry on till the next scene. I started using a file for each chapter then someone told me I should use a folder – confusing! Not sure how this is going to look when it’s published. Also, how do you transfer the book into word from Scrivener for the first edit ? It’s ok 🙂 it’s easy to transfer to word and the other is a matter of choice!